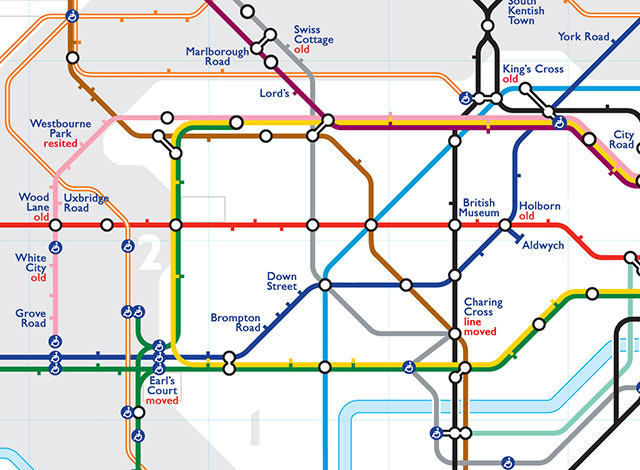 At first glance, this Tube map looks naked. Where are all the station names? Look closer, though, and you'll see some unfamiliar titles. British Museum. Marlborough Road. Mark Lane. And hang on, is that Southend? They're all ghost stations, ones that, mostly due to low passenger numbers, have been permanently shuttered. The stations are time capsules from a different era, and exert a strong pull on the imagination; we've visited one, while Ajit Chambers of The Old London Underground Company wants to re-open some of them as event spaces. Credit for this wonderful piece of ghoulish cartography goes to Dylan Maryk, who plotted the locations on a Google map along with information about when, and why, each was closed, and UsvsTh3m, who turned the results into the Tube diagram above. Thanks to Andy Pick for bringing it to our attention. Transport for London have a habit of getting these things taken down so it might not be long for this world. In a similar vein, we're also very impressed by this map of all the ghost stations along with planned Tube extensions that haven't happened (yet). What happens to old Tube stations?